I am looking for a text editor that will be able to load a 4+ Gigabyte file into it. Textpad doesn't work. I own a copy of it and have been to its support site, it just doesn't do it. Maybe I need new hardware, but that's a different question. The editor needs to be free OR, if its going to cost me, then no more than $30. For Windows. One caveat - has two search functions, Main Search and Quick Find. The lower one, which I assume is Quick Find, is at least an order of magnitude slower than the upper one, which is fast. I've had to look at monster(runaway) log files (20+ GB). I used hexedit FREE version which can work with any size files. It is also open source. It is a Windows executable. He eventually went with Edit Pad Pro, because "Based on my prior usage history, I felt that EditPad Pro was the best fit: it's quite fast on large text files, has best-of-breed regex support, and it doesn't pretend to be an IDE." Instead of loading a gigantic log file in an editor, I'm using Unix command line tools like grep, tail, gawk, etc. to filter the interesting parts into a much smaller file and then, I open that. Have you tried context editor? It is small and fast. I Stumbled on this post many times, as I often need to handle huge files (10 Gigas+). After being tired of buggy and pretty limited freeware, and not willing to pay fo costly editors after trial expired (not worth the money after all), I just used VIM for Windows with great success and satisfaction. For the record I stumbled on it on this blog post, which wisely adviced it. It's really tough to handle a 4G file as such. I used to handle larger text files, but I never used to load them in to my editor. I mostly used UltraEdit in my previous company, now I use Notepad++, but I would get just those parts which i needed to edit. (Most of the cases, the files never needed an edit). Why do u want to load such a big file in to an editor? When I handled files of these size, I used GNU Core Utils. The most common operations i performed on those files were head ( to get the top 250k lines etc ), tail, split, sort, shuf, uniq etc. It's really powerful. There's a lot of things you can do with GNU Core Utils. I would definitely recommend those, instead of a new editor. Sorry to post on such an old thread, but I tried several of the tips here, and none of them worked for me. It's slightly different than a text editor, but I found that Beyond Compare could handle an extremely large (3.6 Gig) file on my Vista 32-bit machine. This is a file that that Emacs, Large Text File Viewer, HexEdit, and Notepad++ all choked on. Memory usage has (somehow?!) never gone above 25MB, so basically no impact on the rest of my system - though it took several minutes to open. There was an accurate progress bar during that time so I knew how it was getting on. Once open, simple searching, and browsing through the file all worked as well as a small notepad file. EmEditor Pro trial was very impressive, the file opened almost instantly, but unfortunately too expensive for my requirements. EditPad Pro loaded the whole 6GB file into memory and slowed everything to a crawl. For windows, unix, or Mac? On the Mac or *nix you can use command line or GUI versions of emacs or vim. For the Mac: TextWrangler to handle big files well. I'm not versed enough on the Windows landscape to help out there. f you just want to view a large file rather than edit it, there are a couple of freeware programs that read files a chunk at a time rather than trying to load the entire file in to memory. I use these when I need to read through large ( > 5 GB) files. Big File Viewer by Team Walrus. You'll have to find the link yourself for that last one because the I can only post a maximum of one hyperlink being a newbie. Admittedly this is a workaround rather than a solution, and there are times when you would need the whole file. But often I only need to see a few lines from a larger file and that seems to be your problem too. If not, maybe others would find that utility useful. A viewer that lets you see enormous text files isn't much help if you are trying to get it loaded into Excel to use the Autofilter, for example. Since we all spend the day breaking down problems into smaller parts to be able to solve them, applying the same principle to a large file didn't strike me as contentious. HxD -- it's a hexeditor, but it allows in place edits, and doesn't barf on large files. Tweak is a hex editor which can handle edits to very large files, including inserts and deletes. EmEditor is now able to open even larger than 248 GB (or 2.1 billion lines) by opening a portion of the file with the new custom bar - Large File Controller. The Large File Controller allows you to specify the beginning point, end point, and range of the file to be opened. It also allows you to stop the opening of the file and monitor the real size of the file and the size of the temporary disk available. I found that FAR commander could open large files ( I tried 4.2 GB xml file) And it does not load the entire file in memory and works fast. Textpad also works well at opening files that size. I have done it many times when having to deal with extremely large log files in the 3-5gb range. Also, using grep to pull out the worthwhile lines and then look at those works great. The question would need more details. Do you want just to look at a file (eg. 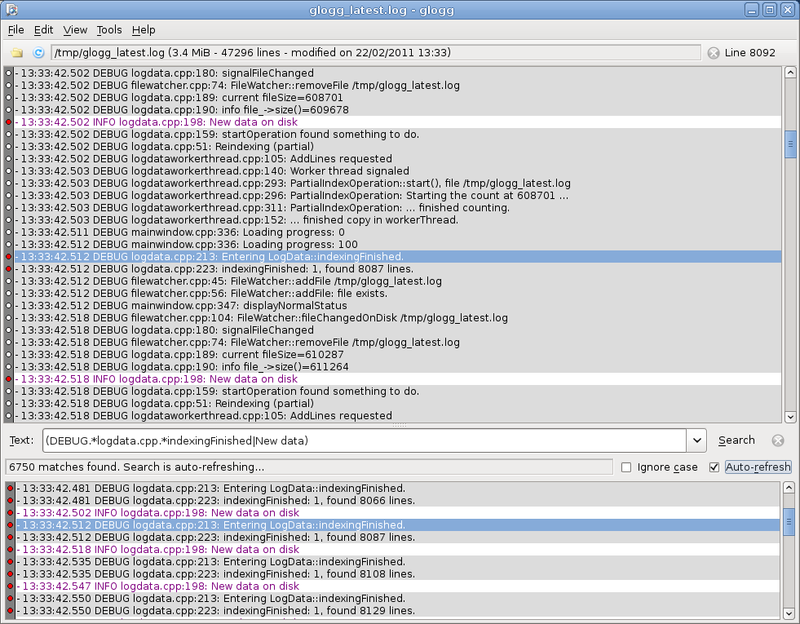 a log file) or to edit it? Do you have more memory than the size of the file you want to load or less? For example, TheGun, a very small text editor written in assembly language, claims to "not have an effective file size limit and the maximum size that can be loaded into it is determined by available memory and loading speed of the file. [...] It has been speed optimised for both file load and save." To abstract the memory limit, I suppose one can use mapped memory. But then, if you need to edit the file, some clever method should be used, like storing in memory the local changes, and applying them chunk by chunk when saving. Might be ineffective in some cases (big search/replace for example). I have had problems with TextPad on 4G files too. Notepad++ works nicely. Emacs can handle huge file sizes and you can use it on Windows or *nix. What OS and CPU are you using? If you are using a 32-bit OS, then a process on your system physically cannot address more than 4GB of memory. Since most text editors try to load the entire file into memory, I doubt you'll find one that will do what you want. It would have to be a very fancy text editor, that can do out-of-core processing, i. e. load a chunk of the file at a time. You may be able to load such a huge file with if you use a 64-bit text editor on a computer with a 64-bit CPU and a 64-bit operating system. And you have to make sure that you have enough space in your swap partition or your swap file. Why do you want to load a 4+ GB file into memory? Even if you find a text editor that can do that, does your machine have 4 GB of memory? And unless it has a lot more than 4 GB in physical memory, your machine will slow down a lot and go swap file crazy. So why do you want a 4+ GB file? If you want to transform it, or do a search and replace, you may be better off writing a small quick program to do it. Not the answer you're looking for? Browse other questions tagged editor text-editor text-files large-files or ask your own question. Viewing large XML files in eclipse? Free Text Editor with built-in SVN Support for Windows?